Serious motor vehicle accidents can result in substantial injuries, many of which can negatively and permanently affect a person's quality of life. 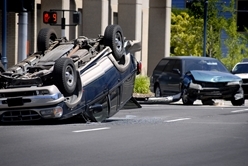 Rollover accidents can be especially frightening, not to mention potentially devastating for those involved. Although rollovers are relatively rare— accounting for just two percent of all crashes—these accidents account for more than one-third of all passenger vehicle deaths, according to the Insurance Institute for Highways Safety Highway Loss Data Institute (IIHS HLDI). While no one can prepare you for what it's like to have your vehicle roll over in an accident, an experienced and reputable personal injury attorney can advise you on what to do immediately after an accident, and walk you through each and every step of the process should you decide to file a lawsuit against the at-fault driver. Vehicles are subjected to a complex mix of physical forces during a rollover accident. However, this isn't the only reason that rollover crashes have the potential to be so problematic. With most vehicle manufacturers focusing on protecting drivers and passengers from front, rear, and side threats, new advances in roof safety aren't always top priority. This is a shame, as an inadequately supported roof can collapse inward during a rollover event. Of course, this isn't to say that vehicle roof safety technology doesn't exist. For example, electronic stability control (ESC) is designed to help motorists avoid rollovers in the first place by preventing the sideways skidding and loss of control that can precipitate these crashes. All vehicles with a 2012 model year or later are required to include the technology, which has been shown to reduce the risk of fatal single-vehicle rollover accidents by up to 70 percent. In addition to ESC, the best defense against rollovers is a strong roof, according to IIHS HLDI. Rollover accidents usually affect five main areas of the body: the head and neck, the upper limbs, the lower limbs, the abdomen and the thorax, with head and neck injuries being the most common. Accident victims can sustain a variety of injuries, ranging from mild to very serious, such as bruises, cuts, scrapes, broken bones, spinal cord injuries, and traumatic brain injuries. The effects of these injuries can result in long-term communicative, visual, cognitive, emotional, and psychological problems. Accident victims may also experience lost teeth, nerve or organ damage, amputation of limbs, hearing loss, and chronic pain. Don't let the shock of being in an accident stun you into inaction. Once you've checked everyone involved for injuries and summoned help, if needed, take photos of your injuries and the accident scene, write down the names and contact information of any witnesses, request a copy of the police report for your records, and call your attorney. Were you or someone you love seriously injured in a rollover accident caused by another motorist? If negligence was a factor, you may be eligible to seek compensation for damages, including medical costs, property damage, lost wages, and more. You've already had your life turned upside down—literally—don't miss the opportunity to set things right. Contact the Morris James Personal Injury Group today to schedule a free initial appointment to discuss your case.